Tell me, fellow kids: have any of you ever practised kinhin walking meditation? There are probably more poetic breakdowns but basically, it’s about moving very slowly, half-step to half-step, in time with your breath, while trying not to fall over. It’s a pleasant way to clear your head after, oh, I don’t know, a couple of hours spent banging out some hasty pre-review impressions of a forthcoming video game. And at the risk of causing your eyes to roll permanently backward into your skull, it reminds me strongly of Dark Souls. Kinhin magnifies your sense of space, you see, turning rooms into valleys, tables into distant plateaus, and that’s a Dark Souls mood to the marrow. You don’t hurry through the game, not unless you’ve played it so often that avoiding, say a bridge-length deluge of fire is a question of muscle memory. Rather, you inch boldly forth, shield held before you like a crucifix, shoulders clenched, bladder squeaking. You are a lone pawn on the chessboard, facing an endless quantity of queens, rooks and bishops. It’s a recipe for caution, to put it mildly, and one consequence is that the world of Dark Souls, an in-itself massive environment, feels absolutely ginormous. Six feet in Lordran are worth six hundred in any other game, simply by virtue of the concentration you’re asked to apply to every, potentially fatal centimetre. Among the many surprises of Sekiro: Shadows Die Twice is that you don’t have to linger quite as much on every footfall. Yes, the game’s desolate Sengoku-era Japan is absolutely jumping with dreadful people and creatures, many of them lurking in blindspots, and many of them endowed with abilities (e.g. horribly drawn-out back-break attacks) that will slay you instantly. 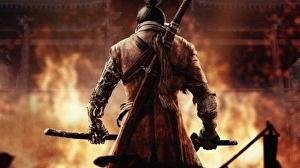 But you are much better able to get around them, or rather over them, thanks to protagonist Sekiro’s upgradeable prosthetic arm. Among its basic functions is a grappling hook, which yanks you towards pre-specified points like a shabby, grimdark Spider-Man. Tap it again mid-air and you can latch onto another point without touching down – chaining your leaps into a swooping, aerial tour of some beautiful terracotta rooftops and bamboo-furnished cliffs, leaving unpleasant creatures like ogres to choke on the dust from your coat-tails.